Leicester Square is of enough importance to London that it is worth noting the statues there, even though they are not worth going to see for themselves. By way of excuse, part of Leicester Square's charm arises from its unpretentious, intimate feel, and large monuments would probably be inappropriate. Fontana's copy of Scheemakers' Shakespeare. The only 'monument' as such in the square is the central marble fountain, with Shakespeare on top, and dolphin accoutrements around. The sculptor was G. Fontana, working in the 1870s, and he copied the statue from one in Westminster Abbey, designed by the architect William Kent, and sculpted by the eminent sculptor Peter Scheemakers. Leicester Square was purchased for the nation by Baron Grant in 1874. (Baron Grant's title, apparently, was an Italian one, given to him by the City of Milan for financing the Galleria Vittorio Emanuele in that city - thank you to Stephen Grant for providing this information). Baron Grant's fortune was large - he spent �,000 buying the square and fitting it out. As well as the central Shakespeare statue, four busts in white marble on granite pedestals, all of a similar date, were placed at the corner sites. All four are in bad shape - Newton by William Calder Marshall is the most decayed. The others are a rather feeble Sir Joshua Reynolds (the first President of the Royal Academy) by Henry Weekes, John Hunter (a pioneer of surgery) by Woolner, and a rather spirited bust of Hogarth by Joseph Durham. They were removed in the 2011/12 revamp of the square, and have not yet been returned. Why were these sculptures chosen? Newton lived close by in St Martin's Street. John Hunter opened the first Anatomical Museum in the Square in 1785 - the collection survives as the foundation of the Hunterian Museum, and Hunter was buried in St Martin's in the Fields at Trafalgar Square. More relevantly to these artistic pages, Hogarth and Reynolds both lived in the Square. Hogarth lived in a house in the south east corner from 1733. After he died, his widow remained until her death in 1789. The following year, Hogarth's remaining pictures were auctioned in the Square, at a tavern there, achieving a total of �5. As an example, 'a parcel of Academy figures and studies' went for 11 shillings and sixpence. Sir Joshua Reynolds lived on the west side of the square, as did his pupil and follower Sir Thomas Lawrence. In the Square there is also a harmless modern statue of Charlie Chaplin (1981) by John Doubleday - he has done better things. We may note the buildings on the north side of the Square - the Empire with decorative tilework in blue and cream, and the late 1930s Warner Cinema which has relief figures of a man and a woman in motion - very much of the period. Queens House, also on the north side, is a white painted building with charming decorative figures, a sphinx, putti in high relief, winged heads and shells and garnishes and flourishes, a sort of mix of exuberant baroque with some hint of nouveau in the faces. It is dated 1897. 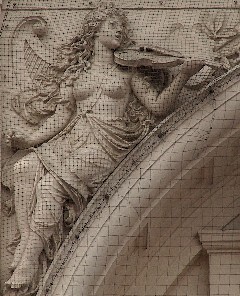 The two figures are Music and Dionysus , doubtless indicating the specialities of the house when the building was put up. 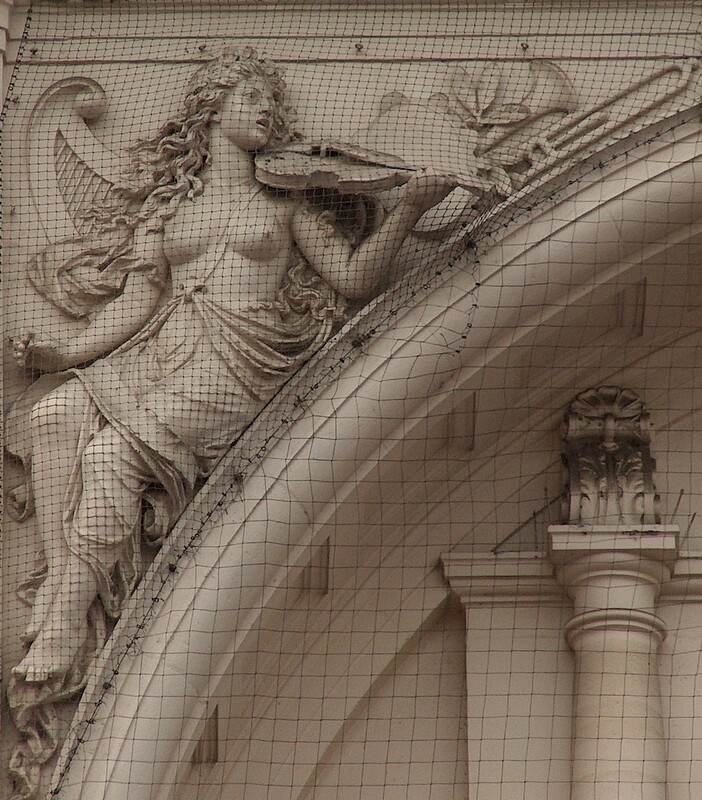 Music, with violin; French horn and harp behind. The north side of Leicester Square is also one of the best places for a view of the chariot and horses on top of the Hippodrome on Charing Cross Road (by the theatre and music hall architect Frank Matcham), dating from the turn of the century. The connection with the cinema goes back a long way - in the 1790s Panoramas were exhibited in Leicester Place in a purpose-built circular building. That building was converted in the 1850s into a French Church (Notre Dame de France), and although it was bombed in World War II, the current church on the site has again been built in a circular shape. Another circular building occupied the centre of the square for a while in the 1850s. This was Wyld's Great Globe, an ambitious display with a 10,000 sq ft representation of the world painted inside. Scaffolding allowed visitors to climb up and view any part of the world they wished. In 1854 a scale model of the Crimea was installed, so that the positions of the armies could be plotted daily as news came in. An Oriental Museum also exhibited here in the late 1850s. 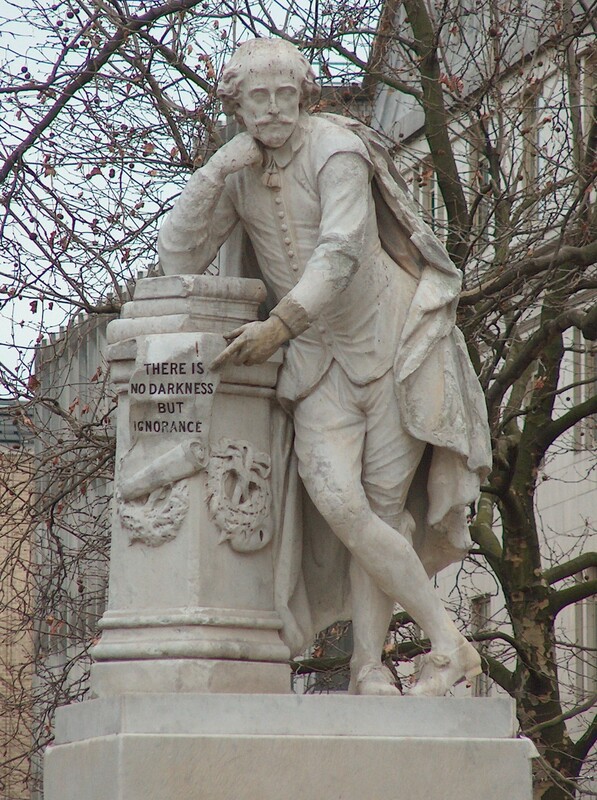 We may mention another sculpture which came to a cruel end in Leicester Square. The Square took its name from the Earl of Leicester, who had a mansion on the site in the 18th Century. Other fashionable folk moved nearby, and it was they who wished to buy a statue of the current monarch (George II). What they bought was in fact an equestrian statue of George I, sculpted by C. Buchard, with the horse modelled on that by le Sueur in Trafalgar Square. Considered a great work of art at the time, George I and his horse were gilded and placed in the centre of the square. Alas, over time the Square became less fashionable, the well-to-do moved out, and the area went downmarket. 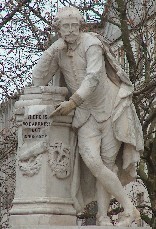 By the time the Panorama and Wyld's Great Globe had closed down, the Square had become a dumping ground for rubbish, and the statue had fallen into ruin. First the arms dropped off. Then the legs went missing. Someone took the head away, and then the dismembered torso was wrenched off the horse and propped up against it. The final blow came when persons unknown whitewashed the horse and painted black spots on it to make it look like a cow. The remains were soon afterwards destroyed.